Cheap flights on low-cost airlines allow for low-priced tickets when flying from London, Manchester, Glasgow, Liverpool, Belfast, Liverpool, Bristol, Dublin, Cork to airports in Berlin. Berlin currently has two major airports that are used for commercial flights. The most conveniently located airport is Flughafen Tegel (TXL) in the northern suburbs of Berlin. However, most low-cost airlines fly to Flughafen Schönefeld (SXF) to the south of Berlin. Fortnately, ground transportation is well organised and cheap to both airports. NOTE: Berlin Brandenburg International Willy Brandt Airport (BER / BBI) will replace Berlin Tegel (TXL) and Berlin Schönefeld (SXF) airports as the only airport serving the capital of Germany from June 2012 October 2013 eventually. German low-cost airlines have basically abandoned routes from Berlin to Great Britain and Ireland. Lufthansa often have very good special fares that can compete with low-cost airlines, especially for travelers with check-in luggage. Easyjet and Ryanair have the most flights from British and Irish airports to Berlin-Schönefeld Airport (SXF). Low-cost airline Easyjet has the largest number of flights from the UK and Ireland to Berlin. Easyjet flights arrive at Berlin-Schönefeld Airport (SXF). Easyjet flies to Berlin from Belfast (BFS), Bristol (BRS), Glasgow (GLA), Liverpool (LVL), London-Gatwick (LGW), and London-Luton (LTN). Irish budget airline Ryanair flies to Berlin Schönefeld Airport (SXF) from Dublin (DUB), East Midlands (EMA), Edinburgh, London-Stansted (STN), and Shannon. Irish airline Aer Lingus flies to Berlin Schönefeld (SXF) daily from Dublin (DUB) and four times per week from Cork (ORK). Connecting flights are available to New York (JFK) and Boston (BOS). German full-service carrier Lufthansa flies from Berlin Tegel (TXL) to London City Airport (LCY). Lufthansa often have return flights on special sale for €99 return. As a full service airline, the ticket price still include free check-in luggage and some free food and drink. British Airways flies up to six times daily non-stop to Berlin Tegel (TXL) from London-Heathrow (LHR) – specials deals are often available. German low-cost airlines have basically abandoned routes from Berlin to Britain. Germany’s favorite low-cost airline airberlin (formerly spelled less hip Air Berlin) used to fly from Berlin Tegel (TXL) three times per day to London Stansted (STN). However, the only way to get to London from Berlin on airberlin is now on connecting flights via either Düsseldorf (DUS) or Nürnberg / Nuremberg (NUE). 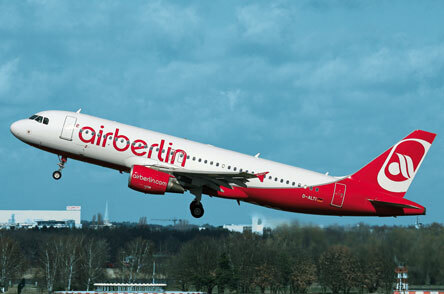 Most airberlin flights arrive at the more convenient Berlin Tegel Airport (TXL) rather than at Berlin Schönefeld Airport (SXF). The center of Berlin can easily be reached on public transportation from both Tegel and Schönefeld.